Chord Electronics Hugo 2 DAC Headphone Amplifier 'Knocks It Out Of The Park' Again! It has been a long wait, but oh boy was it worth it. We now have the all new Chord Electronics Hugo 2 portable DAC and headphone amplifier available for demonstration. A complete re-design of the multi-award winning benchmark DAC, the MK2 Hugo raises the bar once again. In truth, they hardly needed to, as the old one still has the gong but that isn't Chord's way; if it can be bettered then they're 'gonna' do it! We are hearing significant improvements in detail, dynamics and timing over the old model thanks in part to the dramatic increase in the number of taps within the Field Programmable Gate Array (FPGA) silicon. All inputs and filter options are displayed via coloured LEDs much like that of the Chord Electronics Mojo for ease of use. Although initially designed to be the world's best portable DAC and headphone amp in reality the original mostly found it living amongst the best home Hi-Fi systems as the primary DAC, such was its giant killing credentials. This fact was not lost on Chord, so one of its new features is that it automatically stops charging the internal battery when it's plugged into the charger for 24hrs which extends battery life. Additionally Hugo 2 is now fully remote controlled, another nod to non-portable application. Full feature list and technical specification can be found here. You can read the latest What Hi-Fi? review of the Hugo 2 here. Hugo 2 is available in black or silver. 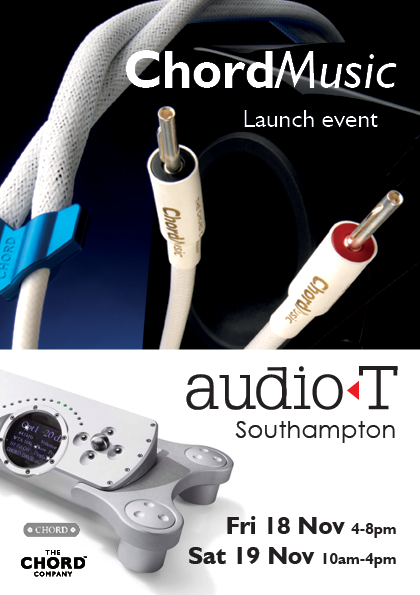 Come in and have a listen at Audio T Reading. I have only been at the company a short time and I was very excited to be given the opportunity to write a blog, so I decided to pick one of my current favourites, the Chord Electronics Mojo, an award winning portable headphone amplifier and DAC (digital to analogue converter). While it may look small it’s certainly not light weight, it feels very solid in your hand and gives you the impression that it is built to last. The device has a very simple layout and is operated with the use of only 3 buttons these are power on and 2 volume controls (+ and -). By using a series of button press combinations you are able to easily adjust the input / output settings of the DAC. For example holding down the volume control buttons when the device is being powered up will set it to the LINE out function. The Mojo can be used with a variety of different digital sources. It can be used with a PC or Mac an iPad or Android tablet or phone. It can also turn its hand to being used in a system as a standalone DAC. To listen to the Chord Electronics Mojo I used two different sets of headphones: the impressive Audioquest Nighthawks as well as my trusty Sennheiser HD 25-1 so I would be able to see how it would sound using two different brands of headphones. The sound ‘quality’ was immediately noticeable, clarity and dynamics stood out, with the DAC doing wonders and the amplifier giving grip and drive to the headphones. I used a variety of music genres so I could get an honest opinion across the musical spectrum. On the Audioquest Nighthawks I got the impression that there was smooth clear balance to the sound and they quite obviously benefited being plugged into such an accomplished DAC come headphone amp. My trusty HD25’s have never sounded so good and I honestly didn’t think they could sound that good! This product is in my opinion the leader in its class and will not disappoint when it comes to a great audio experience, really bringing out the sound stage enhancing the listening experience, in the grand scale of things the Chord Electronics Mojo really packs its punch for the buck. The original M-DAC caused quite a stir when released and for good reason as it is highly specified with many features that belie its modest price. The latest mini/portable headphone amp/DAC from Chord Electronics is here, and surprisingly inexpensive for Chord at £399.99.